As the second-longest holiday play in Chicago, the American Blues Ensemble treats Chicago audiences to a live 1940s radio broadcast of holiday favorite It’s a Wonderful Life for the 17th year. The incredible cast recreates the entire town of Bedford Falls with Foley sound effects, an original score and holiday carols. The Bedford Falls “residents” extend their hospitality after every performance when audiences are treated to milk and cookies served by the cast. The cast of It’s a Wonderful Life: Live in Chicago! includes Brandon Dahlquist (George Bailey), Dara Cameron* (Violet), Ian Paul Custer* (Harry), Matt Edmonds (Announcer/Pianist), Shawn Goudie* (Foley), James Joseph* (Uncle Billy), John Mohrlein* (Clarence/Mr. Potter), and Camille Robinson* (Mary Bailey). Throw your hands up, Chicago—the holiday treat set to a bangin’ beat is back! CST and Chicago hip-hop sensation the Q Brothers—creators of Othello: The Remix and Funk It Up About Nothin’—turn up the volume on Charles Dickens’ classic tale, mixing everything from reggae, dancehall, and dubstep to epic rock ballads. Brighten your festivities with some cheeky spirit and a whole lot of heart—complete with visits from a Jamaican Jacob Marley and that youngest of Cratchits, Lil’ Tim. The Q Brothers are joined by a live DJ as the ghosts of Hip-hop Past, Present, and Future lead Scrooge on a journey of rhythm, rhyme, and redemption. With a lively score and captivating choreography, A Christmas Carol will take families on a timeless holiday adventure with Scrooge as he travels through time with three special ghosts. Over 30 colorful Dickensian characters are brought to life on stage in this uplifting tale of hope and redemption. Complete with falling snow, magical illusions and special effects, the play is a visually-stunning experience, and at one hour long, perfect for children of all ages. On select performance dates, families will have the opportunity to have breakfast or dinner with Santa Claus in Drury Lane's elegantly decorated dining room. 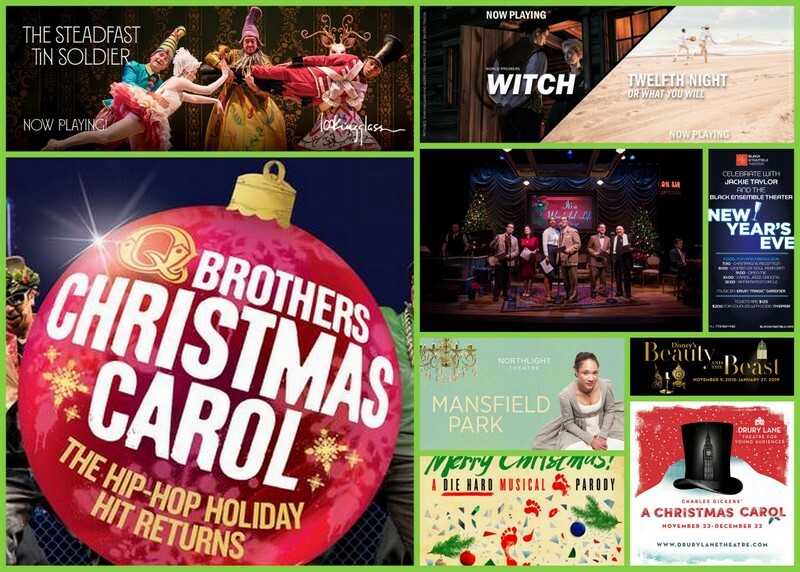 Tickets for Drury Lane Theatre productions are available by calling the box office at (630) 530-0111, TicketMaster at (800) 745-3000 or visiting DruryLaneTheatre.com. Continue the holiday tradition of gathering the whole family for our heartwarming production of Charles Dickens’ A Christmas Carol, the classic tale of the miserly Ebenezer Scrooge. Stop by our omelette bar, make your own donuts, and enjoy our holiday hot chocolate station. Let the little ones write out their wishes in a letter to Santa that we will send straight to the North Pole! Indulge in a special afternoon tea where all princesses will be able to get their hair and makeup done. This tea features freshly baked breads and scones, tea sandwiches, and enticing desserts, as well as an assortment of seasonal teas. Reservations must be made 24 hours in advance. We invite you to join us in welcoming the holiday season at our official Christmas tree lighting ceremony. Inspired by our production of Disney’s Beauty and the Beast, this year’s Christmas tree design perfectly captures the magic and wonder of the season. Add to your experience by arriving early to enjoy our A Christmas Carol breakfast buffet or taking in a performance of our family-friendly A Christmas Carol after we switch on the light. Don’t miss your chance to purchase one of our limited-edition holiday ornaments to take home to your own tree! From eggnog and our signature homemade donuts to our hand-carved prime rib, we have all your holiday favorites. Make your memories last with a family photo around our sparkling 20-foot Christmas tree before seeing our dazzling production of Disney’s Beauty and the Beast. Indulge in a special holiday afternoon tea while listening to your season favorites played by our live pianist. Featuring freshly baked breads and scones, holiday tea sandwiches, enticing desserts, as well as seasonal teas and unlimited champagne. Reservations must be made 24 hours in advance. Treat the whole family to a festive evening with a savory dinner before the December 12th evening performance of Charles Dickens’ A Christmas Carol, the classic holiday tale of the miserly Ebenezer Scrooge. We have something for everyone from honey-glazed ham and pot roast to macaroni and cheese and an ice cream station. Don’t forget to take a photo with Santa in front of our sparkling 20-foot Christmas tree! After all the presents are open, let Drury Lane take care of the cooking. Start off with a freshly made omelette or hand-carved prime rib and finish with our warm vanilla bread pudding with caramel bourbon sauce. Ring in 2019 with Drury Lane and indulge in a decadent four-course dinner at Lucille. Toast to the New Year with a glass of champagne in a commemorative flute, and then enjoy our live music and bar until 1 am. Add to your celebration with a performance of Disney’s Beauty and the Beast. Enjoy Lucille’s champagne brunch featuring decadent cuisine, lavish desserts and signature cocktails. With over ten stations of gourmet food to choose from, our brunch is the best way to spend your New Year’s Day. Press Opening: Saturday, November 17, 2018 at 2:00 p.m. The Steadfast Tin Soldier features Anthony Irons (Goblin), who was recently named a Lookingglass Artistic Associate. This is Iron’s first show with the company as an Artistic Associate. The cast also includes Artistic Associates Christopher Donahue (Nursemaid), and Kasey Foster (Ballerina), with John Gregorio (Rat), and Alex Stein (Steadfast Tin Soldier). Original music is composed by Artistic Associate Andre Pluess and Amanda Dehnert. Musicians include Leandro López Várady (Music Director/Piano), Greg Hirte (Violin), Michal Palzewicz (Cello) and Constance Volk (Woodwinds). The Second City will offer a limited number 2:00pm weekday matinees on December 7, 13, 14, 19, 20 and 21. Special New Years Eve packages are also available. This hilarious show pulls a festive mix of material from The Second City archives and is the perfect way to celebrate winter in Chicago. It’s the most wonderful time of the year-ish! Laugh along with The Second City as comedy’s best and brightest roast the chestnuts outta all the things we lovingly loathe about the holiday season. Why, it’s enough merriment and music to keep you jolly ’til the Chicago snow melts…next May. Press Opening: Wednesday, December 5, 2018 at 8:00 p.m. Performance Schedule: Thursdays, Fridays and Saturdays at 8:00 p.m. and Sundays at 3:00 p.m.
Bruce McClane, a grizzled blue-collar NYPD cop, tries to reconcile with his estranged white collar wife Holly Generic at her job at the Nakatomi Plaza in sunny Los Angeles on Christmas Eve in 1987. German terrorist Hans Olo and his henchmen take the cast and audience hostage and it is up to Bruce—with some help from the LAPD, FBI and Arnold Schwartzen-Schnitzel—to save everyone before time runs out. Audience favorite characters like FBI Johnson, Hans Olo, and of course Bruce McClane return with new toe-tapping musical numbers and hilariously nostalgic ‘80s references in this expanded two-act musical. The cast features Jonathan Allsop (Fabrique/Theo), Caitlyn Cerza (Holly Generic), Nate Curlott (FBl Johnson), Gary Fields (Hans Olo), Ashley Geron (Officer Johnson), Bill Gordon (Bruce McClane), Jin Kim (Nakatomi), Terrance Lamonte Rogers Jr. (Carl Winslow), Erin Long (Klause), and Jenna Steege (Willis). Yippee Productions LLC is a new partnership between lead producer Drew DeSantis (Producer at Drury Lane Productions), Jim Jensen (Drury Lane, Royal George, Commercial Theater Producer and General Manager), Mark Michelson (MJA Ventures Chicagoland Theatre Fund, Founder) and the Board of Directors of the former storefront comedy theater MCL Chicago (2014-2018). With a special salute to the undeniable Queen of Soul Aretha Franklin, you do not want to miss this celebratory tribute to some of the most powerful Women of Soul to ever grace the stage. We will honor some of our greatest voices past and present while embracing many different genres of the Soulful Sound with tributes to Mahalia Jackson, Whitney Houston, Natalie Cole, Donna Summer, Etta James, Anita Baker, Diana Ross, Janet Jackson, Mavis Staples, Janis Joplin, Jill Scott and that's just to name a few! And of course, we have to give you a little of Gladys, Dionne and Patti. This is a once in a lifetime musical masterpiece that you will want to experience over and over again! Performance Schedule: Wednesdays at 1:30 p.m., Thursdays at 1:30 p.m. and 8 p.m., Fridays at 8 p.m., Saturdays at 5 p.m. and 8:30 p.m., and Sundays at 2 p.m. and 6 p.m.
Based on the beloved Academy Award-winning Disney film, this nine-time Tony nominated musical continues to win the hearts of people all over the globe. Trapped in her provincial town life, an intelligent, young beauty risks everything to become the heroine of her own story and break a wicked spell imprisoning a castle full of enchanting misfits and a terrifying beast. The cast of Disney’s Beauty and the Beast includes Brandon Contreras (Beast), Erica Stephan (Belle), Mark Banik (Gaston), Sophie Ackerman (Chip), Graham Carlson (Chip, at certain performances), Tony Carter (Lumiere), Nick Cosgrove (Cogsworth), Mark David Kaplan (Maurice), Catherine Smitko (Madame de la Grande Bouche), Bri Sudia (Mrs. Potts), Allison Sill (Babette), and Paul Michael Thomson (Lefou). The ensemble includes Jeremiah Alsop, Anthony Avino, Greg Blackmon, Isaiah Silvia-Chandley, Liz Conway, Shantel Cribbs, Timothy P. Foszcz, Samuel Gardner, Maya Kitayama, Ivory Leonard IV, Omar Madden, Courtney Martin, Conner Wayne Milam, Zach Porter, Emma Rosenthal, Billy Rude, Monica Thomas, and Shanna VanDerwerker. Beauty and the Beast is suitable for all audiences but most enjoyable for ages 5 and up. When shy but clever Fanny Price is sent away by her impoverished parents, she must adapt to life as the poor relation at her aunt and uncle’s wealthy estate. But Fanny soon learns that beneath the glitter of wealth and status, people aren’t always what they seem. Playwright Kate Hamill, known for her acclaimed adaptations of Sense and Sensibility and Vanity Fair, brings her unique sense of playfulness and theatricality to Austen’s classic tale of the clash between love and conscience. The cast of Mansfield Park includes: Anu Bhatt (Maria Bertram/Susan Price), Nate Burger (Henry Crawford/John Price), Kayla Carter (Fanny Price), Kate Hamill (Mary Crawford/Lady Bertram/Chapman), Curtis Edward Jackson (Tom Bertram/Mr. Rushworth/William Price), Heidi Kettenring (Mrs. Norris/Mrs. Price), Mark Montgomery (Sir Thomas Bertram/Mr. Price), and Gabriel Ruiz (Edmund Bertram). One of Western literature’s greatest comedies, Twelfth Night imagines a world where up is down, hot is cold and love is not always what it seems! Directed by Artistic Director Michael Halberstam, Twelfth Night will draw you into its world of lovers and louts, some of them so consumed by their lust for the wrong person they’re unable to see the truth that’s right in front of them. The cast includes: William Brown (Feste), Sean Fortunato (Malvolio), Kevin Gudahl (Sir Toby Belch), Casey Hoekstra (Antonio/Curio), Nik Kmiecik (Valentine/Priest/Others), Jennifer Latimore (Viola), Luce Metrius (Sebastian), Scott Parkinson (Sir Andrew Arguecheek), John Henry Roberts (Captain/Others), Andrea San Miguel (Olivia), Mary Williamson (Fabian), Karen Janes Woditsch (Maria), and Matthew C. Yee (Duke Orsino).